The OCBA Masters Division is pleased to announce Mark Minyard will serve as the 2019 Chair. His one-year term began Jan. 1, 2019. Minyard is Managing Partner of Minyard Morris LLP in Newport Beach. He limits his practice to Orange County Family Law matters. He has been recognized by Super Lawyers and Super Lawyer Top 50 Orange County Lawyers each year since its inception in 2004. Mark is one of only three family law attorneys in California who are Fellows in the American College of Trial Lawyers. He is also a fellow in the American Academy of Matrimonial Lawyers. Mark is AV Peer Review Rated (the highest rating) by Martindale.com, has been listed in the Preeminent Bar Registry for 25 years, and is a Certified Specialist in Family Law by the State Bar of California Board of Legal Specialization. Len is a partner in the Newport Beach office of Newmeyer & Dillion, concentrating his practice in the areas of business, construction, land use and insurance litigation. In his new role, he will leverage extensive experience representing clients in complex business litigation, including trade secret disputes, intellectual property matters, and unfair trade practices. 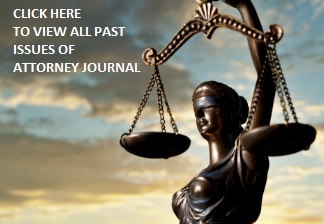 “It is my honor and privilege to serve as General Counsel to a group of outstanding attorneys. I will work hard to prove worthy of their trust in me,” said Len on his appointment. Len earned his B.A. from the University of California, Los Angeles and his J.D. from the University of Southern California. Attorney B. James Pantone was sworn in as the Incoming President of the Orange County Trial Lawyers Association at the 56th Annual Installation & Awards Program on January 26, 2019. Pantone has dedicated his career to advocating for injured victims, including in the areas of product liability, wrongful death, catastrophic injury, premises liability, general negligence and construction law. He has served on the Board of Directors for OCTLA since 2004. Troutman Sanders LLP has promoted Christine Byrnes to partnership. Byrnes represents clients in connection with the financing, development, acquisition and restructuring of energy projects, including in connection with the negotiation of tax equity partnership and lease investment structures. She has negotiated financing and commercial agreements for both lenders and developers, including debt and equity financing documents, letter of credit facilities and joint venture agreements. Byrnes has also represented a number of clients in Shari’ah-compliant finance and investment transactions, including private equity acquisitions, real estate transactions and working capital facilities. John S. Gibson, Partner at Crowell & Moring LLP, was honored as Lawyer of the Year at the Thurgood Marshall Bar Association’s 2nd Annual Gala & Installation Dinner on January 19, 2019, at the Avenue of the Arts Hotel in Costa Mesa. The law firm of Balestreri Potocki & Holmes is pleased to announce that Anthony Chalifoux has been named a Member of the firm. Chalifoux joined the firm as an associate in 2011 and attained Senior Attorney status in 2018. As a firm Member, he will continue to represent a wide variety of clients in civil litigation and transactional matters with a particular emphasis in intellectual property law. Trutan & Tucker, LLP announced the promotion of five attorneys to partnership. Alan Fenstermacher specializes in land use and regulatory issues, including general municipal law, handling both litigation and transactional matters for public and private clients. Andrew primarily represents developers in the acquisition, disposition and financing of various real estate asset types, including multifamily projects, master planned communities, retail and industrial projects, and raw land. A member of the firm’s Intellectual Property group and co-chair of the firm’s Automotive Practice, Ravi Mohan manages IP strategy and thoughtfully scales IP portfolios that attract funding. He also guides companies in IP transactional matters and assists in pre-litigation and settlement counseling. Proud Usahacharoenporn, a member of the firm’s Litigation and Trial section, handles a broad range of business disputes, including litigation regarding contracts, real and personal property, fraud, class actions, insurance coverage, business and intentional torts, unfair competition, and intellectual property. Kenneth Zielinski handles a wide variety of employment-related litigation matters on behalf of employers, including wage and hour class actions; employment discrimination, harassment, and retaliation claims; wrongful discharge; and prosecuting theft of trade secrets by departing employees. His practice also focuses on complex commercial litigation including contractual disputes and business torts. Sullivan Hill is pleased to announce the appointment of Robert Allenby as the firm’s new managing partner. He succeeds Christopher Hawkins, who served a five-year term as managing partner. Allenby has served on Sullivan Hill’s Executive Committee, as chair of the Litigation practice group and as firm counsel to Sullivan Hill. A native of San Diego, he has been practicing in San Diego as a civil litigator for over 27 years. Allenby has extensive experience in all aspects of litigation, with an emphasis in construction disputes, insurance coverage litigation, employment disputes and general business litigation. He has an AV® Preeminent™ Peer Review Rating by Martindale-Hubbell and was named a Top San Diego Lawyer in 2015-2018 by San Diego Magazine.